Offers convenience of inner cannula disposability, while permittingpatient to breathe through upper airway if desired. Disposable Inner cannula (DIC) features integral 15mm snap-lock connector for quick,safe disposal after single use. Smooth, rounded-tip obturatorfacilitates insertion. 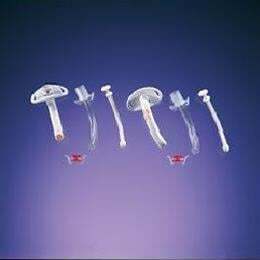 Disposable Decannulation Plug (DDCP) closes theproximal end of the DCFS and DCFN to permit breathing throughfenestration and upper airway. Designed for use to bypass upper airwayobstructions, provide long term ventilation, support and/or managetracheal/bronchial secretions.